Goldman Dilemma. Bob Goldman conducted regular surveys on elite athletes asking them if they would be willing to take drugs that guarantee a gold medal even if their death was inevitable after 5 yrs. Every survey produced results where atleast 50% of the population answered in the affirmative. Similarly if most of us had the chance to live a "happy" life for 40 years or a 100 year old life I would say quite a few would choose the former option. Denmark and Switzerland have highest overall satisfaction with life. 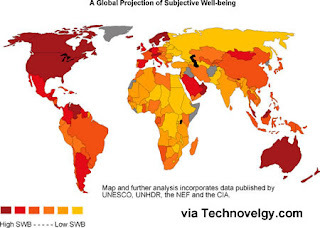 Subjective Well-Being is correlated to most strongly with Health, Wealth and access to Basic Education. From a global perspective, the biggest causes of SWB are poverty and associated variables. People talk about success, fulfillment, self-esteem, peace etc. but these all translate to one word - Happiness. We chase different goals, we choose different paths, cross different milestones but the destination is one. We seek our own methods to taste transient moments of happiness knowing subconsciously that it may not last forever. We seek creative ways to capture the happy feeling hoping that this time the experience is longer. Another surprising fact that I learnt was that we actually celebrate an official "Happiness Day" on August 8 annually. Explanation: Happiness Day is an opportunity to reflect and refuel and remember that the little and big things that we do all year long to try to make the world a better place are helping to make others happy. The more happiness there is in the world, the better the world will be. I would say this is Altruism at its best. This makes me smile.. but it makes me feel sad that people don't realise that bestsellers, announced dates, "proven" theories are not the answer. The answer is YOU. A small step in soul-searching may lead you to some significant answers.. these answers may just be cues to some winding paths.. these may lead you on to some mystical landscapes.. and the search will continue as in Lord of the Rings (It was intriguing, admit it!) ..
P.S. Once you reach there, let me know. No, I don't want the pointers - just the honour of retelling your story aloud! My Answer: 40 years of a happy life, infact 39 will do too! The Upanishads say & I support this- the purpose of human life is to find happiness & fulfillment, in other words it is to pursue happiness, till you experience true freedom! Also, as life is a journey & not a destination, happiness cannot be a destination, but is a ongoing voyage of discovery. It is a shifting goal post........More so when we aim to achieve happines from without rather than within. Hence in finding true happiness, one needs to be selfish & look deep inside rather than depend upon others or external circumstances to be happy. It is but natural that, materialistic nations like Denmark will have poverty as a yardstick in determing an index for happiness. In India, we would measure happiness, with different parameters......again a shifting goal post. Many years ago, Sweden was one of the richest & happiest nations in the world. ( as visitors Sweden was a great place to be in )That is till they meddled with their family stucture ( common law marriages ), causing their society to almost collapse & giving rise to great unhappiness.